the messager provide different styles of message boxes, including alert, confirm, prompt, progress, etc. All the messager boxes are asynchronous. Users can use the callback function to do something after interacting with messager. The properties extend from dialog, below is the added properties for messager. 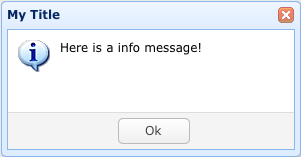 msg string The message to display on the dialog. fn function The callback function when clicking on the OK or CANCEL buttons. showType: Defines how the message window to be showed. Available values are: null,slide,fade,show. Defaults to slide. showSpeed: Defines the time in milliseconds message window finishs show. Defaults to 600.
width: Defines the width of message window. Defaults to 250.
height: Defines the height of message window. Defaults to 100.
title: The title text to be showed on header panel. msg: The message text to be showed. style: Defines the custom style for message window. timeout: If defines to 0, the message window will not close unless user close it. Defines to unzero, the message window will be auto closed when timeout. Defaults to 4 seconds. icon: The icon image to be showed. Available value are: error,question,info,warning. fn: The callback function triggered when clicking on the OK button. The configuration object can be passed to the function argument. fn(b): The callback function, when user click Ok button, pass a true value to function, otherwise pass a false to it. fn(val): The callback function with a value parameter user entered. $.messager.progress options or method Show a progress message window. title: The title text to be showed on header panel, default ''. msg: The message box body text, default ''. text: The text to display in the progress bar, default undefined. interval: The length of time in milliseconds between each progress update, default 300.
bar: Get the progressbar object. close: Close the progress window. Now close the message window.